Despite a significant improvement in formal education in the Middle East during the past few decades, the gap between education and employment is still widening. Governments across the MENA region have invested heavily in education, and the past decade has witnessed a rapid expansion of primary, secondary and tertiary education. Yet, the results have been more or less disappointing. Schools and universities are turning out graduates lacking the skills they need to succeed in job markets, and the job market itself is hamstrung by economic mismanagement. The result: high levels of education with mass unemployment. The belief that the education system in the Middle East is lagging behind isn’t new. 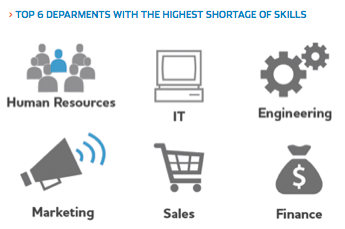 In fact, the Bayt.com Middle East Workplace Dynamics poll, June 2013, shows that while 63% of professionals in the MENA region feel that the job market is picking up, 20% still blame the education system for being ill-prepared for the current requirements and skills required by the job market. According to the same poll, the inadequacy of the regional education system is also seen as a major roadblock for career growth. This is simply due to the fact that education and professional training are necessary to thrive in an increasingly competitive market. Other major impediments cited in this poll included bad managers (13.7%) and the bad economy (14.9%). In their next job, a fifth of respondents (20.3%) said they were looking for companies that would provide learning opportunities and training programs and help them develop their skills. This came well before the pursuit of a good work environment (18.8%), or even better pay (16%), as important factors when looking for a job. When it comes to creativity and education in the region, 73% of respondents in the Bayt.com February 2015 Education and Innovation in the Middle East poll said that their own creativity is being stifled by the educational system in their country; another 42% agreed that their country’s educational system needs to be more innovative in order to adapt to changing times. If you take age differences into consideration, the Millennials in the Middle East survey conducted in February 2014 shows that 83% of millennials (those aged between 18 and 35 years old) in MENA agree that unemployment is a significant issue in their country. When asked about the changes they would like to bring to their organization, 51% of respondents said they would like to see more training opportunities and the chance to learn new skills. When it comes to education, only 38% of respondents in the MENA believe that their education has prepared them for the workplace completely. The majority feel that pursuing higher education is a way to enhance career options, including better positions and promotions. This is felt more by millennials than by the older generation (73% of those under 35; compared to 68% of those 35 and up). As for the biggest barriers to career growth for millennials in the MENA, three in 10 (31%) of them feel that a disconnection between their educational qualification and their current job profile presents a major barrier followed by an inadequate or lack of relevant training (28%), as per the Millennials in the Middle East survey. For respondents aged 35 and up, the biggest barriers for growth are lack of financial support (44%), followed by family commitments and responsibilities (27%), and, similarly to their younger counterparts, the disconnection between their qualifications and current job profile, but only at 25%. This clearly shows that the older group share a more positive view of the education they received compared to the younger generation. There are all sorts of reasons to get an education, or even new skills. It gives you an edge and perspective on the world and helps you build a career. Unfortunately, this link between education and jobs seems to be breaking down in the MENA. So what has gone wrong? Why has so much education and public investment failed to create a virtuous cycle of economic growth, job creation and expanded youth opportunity? The answers to these questions vary across countries, but one common factor stand out: the chronic misalignment of the education system and job markets. The Middle East urgently needs measures to address the misalignment of education and employment which implies the match of people entering the job market with skills in demand. 1. Increase investments in training. In an increasingly knowledge-based global economy, that means building basic competencies and the flexible skills associated with problem-solving. So when you take a job, look for a company where you can learn something. Join a company that will invest in you because early in your career the learning is worth far more than the salary. The Bayt.com Learning in the MENA Workplace poll, March 2015, shows that 25% of MENA professionals feel that ample learning and training opportunities at work is their top motivator apart from their salary; an overwhelming 98% of them say that working in an organization that provides learning and training is very important. Fortunately, the majority (73%) of respondents in the Skills and Hiring Trends in the MENA poll, January 2015, said that investment in training will increase in 2015. 2. Matching curricula and teaching styles with general skill needs of the current workforce. This is a very complex problem to fix, but at least the issues are on the table. Education providers should coordinate their efforts with corporate recruiters and learn more about the needs of the job market. A hunger for lifelong learning should be instilled at an early stage with a clear infrastructure put in place. Training initiatives should successfully marry the classroom with on-the-job training. Training curricula should include preparation for the business world and impart a clear idea of how the business world works. 3. Capitalize on development programs. If you don’t take the time, spend the money, or learn how to build world-class development programs, you will not be able to compete. There is no real war for talent, there is a “war for skills”, and what better way to win the war than to build your arsenal internally. 4. Rethink the education model. The online courses offered by Bayt.com on Edraak, an open online course platform launched by the Queen Rania Foundation, are only an example of the many technological disruptors that will be reshaping the future of education in the region. The Bayt.com Specialties is another great platform for professionals to increase their know-how and even get ranked for what they know. At Bayt.com, our mission has always been to empower people with the tools and information they need to build their lifestyle of choice, so we are constantly creating innovative solutions to make it easier for both job seekers and employers to succeed in their learning and career. Bayt.com research has shown over and over again that while education is viewed as incomplete by many professionals in the region, training and development opportunities offered by companies are highly valued. Companies offering training would most probably see lower labor turnover and a lower skills gap. We can also conclude that without major changes in the current educational system, the situation will only get worse. The vast majority of jobs now require more technical grounding, problem solving, creativity and better communication skills. But most people don’t know what businesses expect and universities don’t necessarily teach them these skills. This is why professionals should start seriously looking at other methods of gaining knowledge in order to stay relevant– whether through formal higher education, online resources, apprenticeships, or specialized training and workshops. There are many reasons to get a good education, but ultimately it must provide a pathway to a promising and successful career. All of the above will require a significant cultural change and funding. But I’m convinced that emphasizing work-linked learning, where curricula closely tracks the demands of the job market, will help us raise the skill levels of new graduates– a key ingredient in the recipe for economic prosperity.